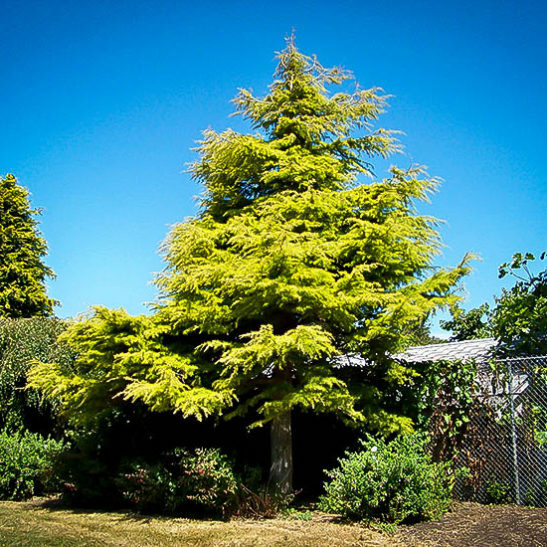 The Golden Atlas Cedar is a dramatic and exciting specimen tree for any large lawn area, or as part of the background tree planting of your property. It develops into a broad tree with widely spaced sweeping branches, creating a unique profile. To add even more beauty, the young leaves are a golden yellow color, making the tree look like it is frosted with lemon icing. This easily-grown tree is hardy in all mild and hot areas of the country, and it is drought resistant too. It forms a tree 25 to 35 feet tall, with horizontal branches radiating 10 to 12 feet out from the trunk. It has no pests or diseases and grows well in any well-drained garden soil. It even makes a beautiful bonsai tree, or it can be grown in a large pot for many years. 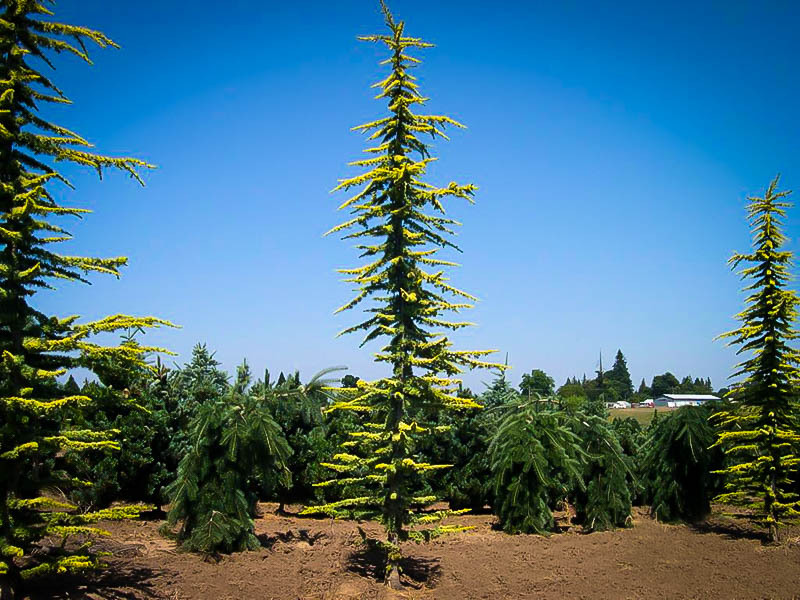 If you want something very special, and are bored with the standard blue spruce on everyone’s lawn, then the Golden Atlas Cedar is exactly what you have been looking for. Choose a sunny location in any soil that is not always wet, for your tree. Young trees benefit from some afternoon shade to keep the yellow needles fresh and brightly colored. 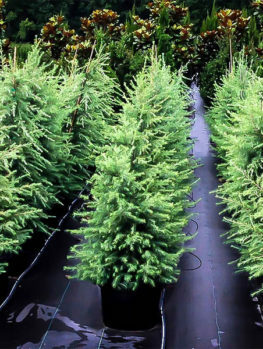 Water regularly for the first season or two, and after that your tree will be drought and heat resistant. Some shelter from strong winds will prevent any damage to foliage in winter. This tree is more resistant to urban conditions than the Lebanese cedar. It requires no care to become a grand specimen, and it should not even be trimmed, so allow sufficient room for it to spread when choosing a planting spot. Trimming spoils the unique character of the tree, by preventing the branches sweeping out horizontally. Stately evergreens really bring character and atmosphere to our gardens, especially larger ones where there is room for them to spread to their full glory. Since they can take some years to reach their full potential, planting such a tree is a statement of being settled and comfortable where we are, or of leaving a legacy for the future. 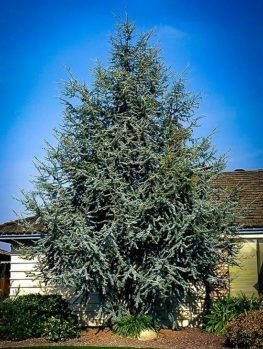 There are few if any other trees that give that air of grace and maturity so effectively as the Atlas Cedar and the closely-related Lebanese cedar. These trees are true cedars, and quite different from the American trees commonly called western cedar, or the Japanese cedar. These trees come from North Africa and the biblical lands of the Middle East, and have a unique spreading habit, maturing with widely-spaced branches and tall trunks. 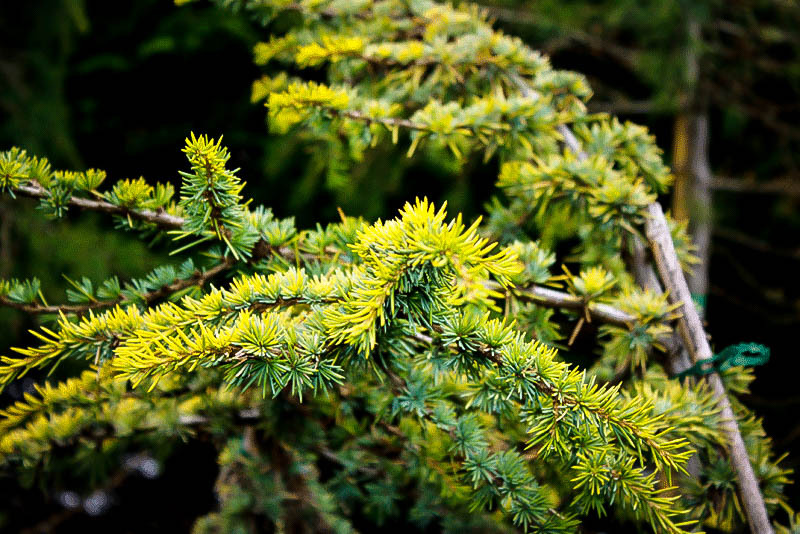 The Golden Atlas Cedar is a special variety, with unique colorings. The needles of this evergreen tree last several years on the tree. In their first year they are yellow, in the second yellow-green, and in the third year bluish-green. So the outer needles glow bright against the darker, inner ones, giving this tree a wonderful and special character. When struck by the spring sunshine, it truly glows as the new needles expand in the warmth of the season. The tree looks like it is frosted with lemon icing, and makes an eye-catching and attractive specimen, even at a young age. 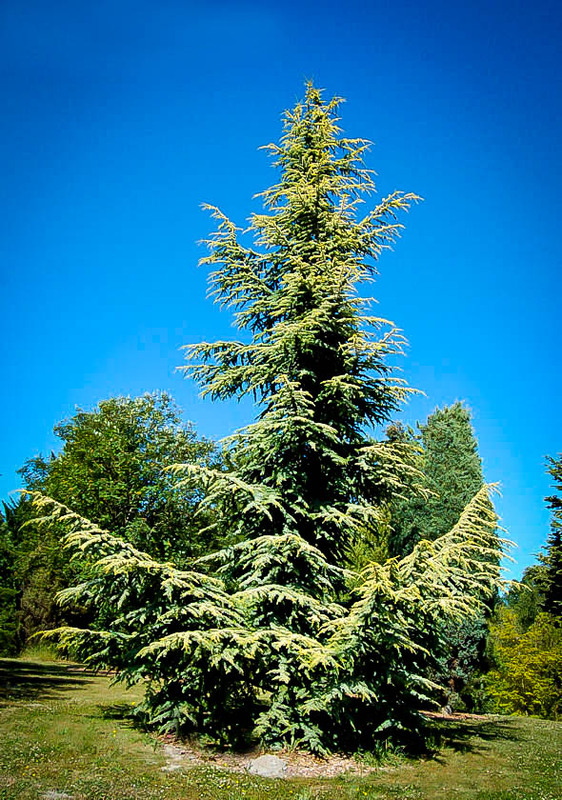 Young Golden Atlas Cedar trees have an upright, denser habit, with the branches ascending to form a conical pyramid. As the tree matures the branches become horizontal, more widely spaced and show more trunk. Eventually the branches sweep towards the ground, giving this tree a dramatic character like no other evergreen. 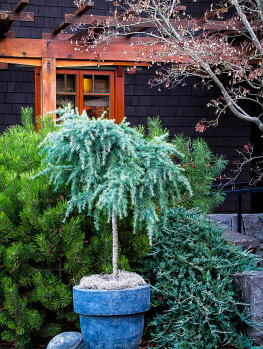 Plant your Golden Atlas Cedar in a sunny spot, preferably with some afternoon shade for a young tree, to preserve the yellow color of the needles. This tree is hardy to minus 10 degrees, so it will grow well in both the east and the west, and it is very drought and heat resistant when established, so it grows perfectly in hot, dry areas. It will grow in any well-drained garden soil, and only requires regular watering in the early years until it is established. It looks majestic on a large lawn, becoming more and more attractive as the years pass. 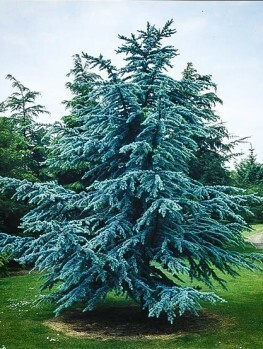 It requires no maintenance, and it should be planted in an open area big enough for it to mature without trimming, as cutting back the branches reduces its unique character. The Atlas Cedar (Cedrus atlantica) grows wild in vast forests across the Atlas Mountains of Morocco, and into neighboring Algeria. It grows into a tree that can be 100 feet tall, with a trunk 6 feet thick. 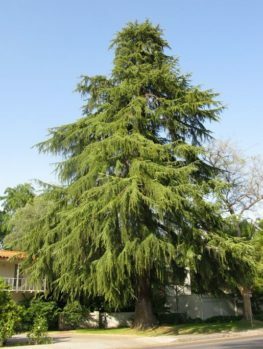 It was introduced into America around 1840, and it is often seen in older urban gardens, since it is more resistant to urban conditions than its relative, the Lebanese cedar. 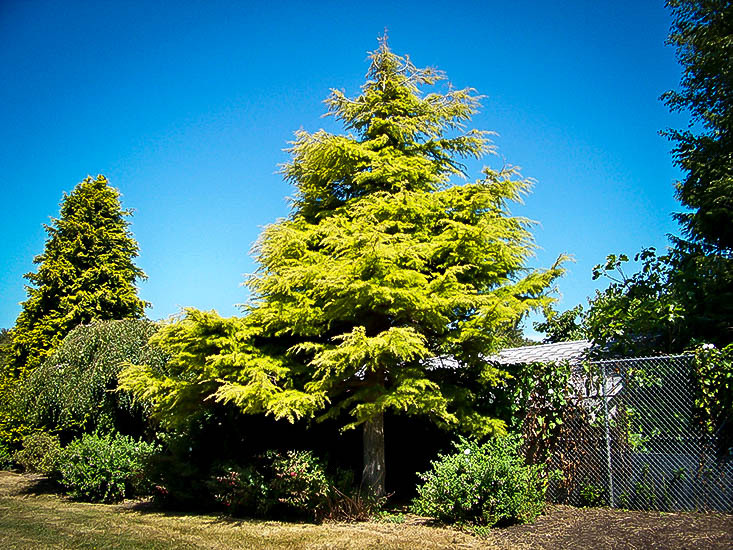 Such a tall tree is rather large for most gardens, but the Golden Atlas Cedar grows to a more modest height of around 25 to 35 feet, and a spread of 15 to 20 feet. This is its first advantage over the wild tree. Its second advantage over the wild form is its color, which rather than the grey-blue of the ordinary tree, is a wonderful glowing yellow in spring, fading very slowly over the seasons into a blue-green. The origins of this unique tree are obscure, but it was discovered, perhaps as a seedling, in the late 19th century in Boskoop, the Netherlands. This area has been the center of the Dutch nursery industry for centuries. It can only be grown by taking stem pieces from correctly identified specimens, and attaching them to the roots of seedling trees. Cheaper trees grown from seed will just be like wild trees, and will certainly not have the dramatic golden coloring of this unique tree. 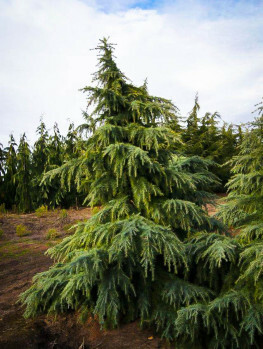 The Golden Atlas Cedar is rarely available at nurseries or garden centers, and at the Tree Center we are pleased to have found a good supply of top-quality specimens to offer to our customers. We know this tree will not be in stock long, with many enthusiasts keen to have a specimen of this unique and striking tree. To make sure you can grace your own garden with its special beauty, order now. 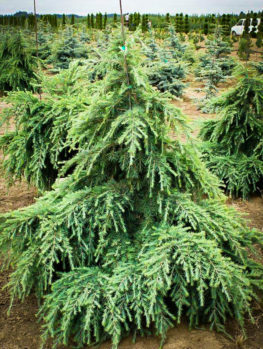 You may also want to consider planting other popular varieties like the Blue Atlas Cedar or the Weeping Blue Atlas Cedar.